SILVERDALE, Wash. - Chief of Naval Personnel (CNP) conducted multiple all hands calls in the Pacific Northwest Region, Sept. 10-11. The visit is part of Vice Adm. Scott R. Van Buskirk's fleet-wide tour, in an effort to inform Sailors of key personnel policies including force management initiatives, efforts to improve sea duty manning, and 21st Century Sailor and Marine programs. "I tell the Sailors that I am here for two reasons. First and foremost is to hear from them; get a pulse of what's on their mind and what are some of the challenges and issues that they are facing, particularly in the manpower and personnel, and the training and educational areas that I represent for our Navy," said Van Buskirk. The CNP also talked about the importance of fleet manning, filling critical billets with qualified, experienced Sailors, both ashore and at sea. "What these Sailors represent for our nation and our Navy and the job that they're doing, it's tremendous," said Van Buskirk. "We are America's away team, always have been and always will be, and while we've been supporting our missions in Afghanistan and Iraq, at the same time we've been present throughout the world. And, now as we follow the defense strategy and rebalance with the Pacific, we've never been more relevant in what we're doing day in and day out," Van Buskirk continued. 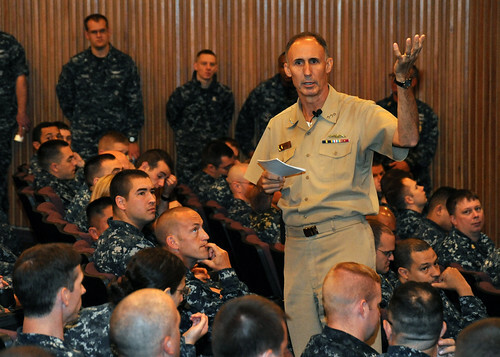 During the all hands calls, Van Buskirk talked about Sailor readiness and emphasized the Navy's need for Sailors who are assignable, distributable, and deployable in an effort to meet the CNOs three tenets of War fighting first, operate forward, and to be ready. "It's all about balancing the workforce, stabilizing where we're at right now and then distributing it correctly," said Van Buskirk. "What we're really trying to achieve is filling our gaps at sea. Our critical priority is to make sure we've got all of our ships manned and ready to deploy and meet all of our mission demands," Van Buskirk added. The CNP's tour in the Northwest region included visits at Naval Base Kitsap Bangor, Naval Station Everett and Naval Air Station Whidbey Island.